Former Claret Danny Ings made his senior England debut as the Three Lions finished their Euro 2016 qualifying campaign with a 100% record. Roy Hodgson’s squad beat Lithuania 3-0 in Vilnius, with goals from Ross Barkley, an own goal from Lithuania keeper Giedrius Arlauskis following a shot from Harry Kane, and a third from Alex Oxlade-Chamberlain. Liverpool forward Ings, who left Burnley at the end of his contract in the summer, replaced former Under 21 strike partner Kane just before the hour. 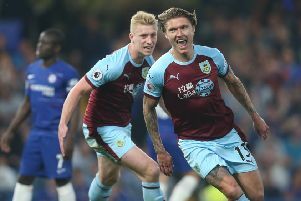 And the Clarets will hope his first full cap adds to his value when a tribunal committee sit, at a date to be decided, to set the compensation figure Burnley will receive from the Anfield club. Even though Ings was out of contract, as he was under 24 at the end of his Turf Moor deal, Burnley are entitled to compensation, which is expected to top the tribunal record of £6.5m set when Daniel Sturridge moved from Manchester City to Chelsea. Ings’ former Clarets teammate Tom Heaton was also a substitute in Vilnius, but awaits his first cap after being selected for Hodgson’s last three squads.